I’ll be the first to admit that I still have a lot to learn when it comes to the rewriting process. I read other authors who talk about writing an entire book manuscript, then letting it sit, then coming back, tearing it up and starting over again. I have come to the conclusion that I can’t do that. I spend quality time on structure and organizing my thoughts before I put words on paper. My hope is that I will begin right, and then impetus will keep me going through the rest of the project. I recently asked a professor friend of mine to read through the project I was working on. His first reaction upon reading the first chapter was to ask: “Why tell this story in the first place?” then “What does this symbolize?” I told him that he was reading too far into the story. Sometimes, to paraphrase Sigmund Freud, a story is just a story. I suspect there is some meaning buried in those stories that I write, in fact I hope there is. But I am of the firm belief that the first priority for the author is to make sure he or she tells a good story. “Never let the truth get in the way of telling a good story,” someone wrote. And so rather than focusing on symbolism, representation or the Greater Good, I will let my stories speak for themselves. There comes a time in your writing when you realize that for good or for bad, your story is going to be what it is. No more and no less. And if it less than perfect, as mine often are, there is always the next story to redeem yourself. On a different note, here’s the image you’ve come to expect with my daily musings. 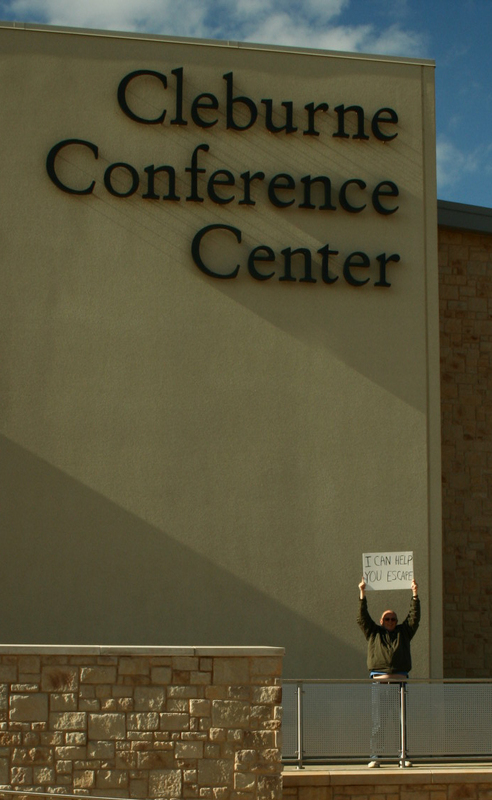 This one is taken outside the Cleburne Convention Center, right here in north Texas. Don’t forget to send in your entries for the contest. The contest begins Monday.